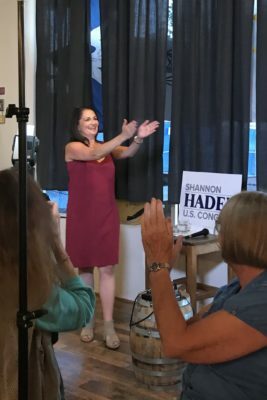 Over fifty supporters packed Geaux Brewing in Auburn tonight to watch election results come in at the conclusion of Washington’s 2018 Top Two election with the hope that Shannon Hader would claim one of the top two spots in WA-08. Hader and her campaign staff worked almost up until a quarter to the hour calling constituents to ensure that ballots had been turned in. Initial results showed that Republican Dino Rossi had 43% of the vote. In second place was pediatrician Kim Schrier with 18.82%, and in third place was attorney and former prosecutor Jason Ritteresier with 17.56%. Hader trailed in fourth place with just 12.5%. She joined the party after these early election results rolled in, with many applause and cheers from the crowd. When speaking with a volunteer who knew and respected all three candidates, he said Hader was the one who truly knew all the issues at their core. “She’s the strongest candidate I’ve seen in years,” he told NPI. The volunteer also noted that when canvassing, constituents seemed to identify with Hader’s message and he thought most would be likely Hader voters. At about 8:45 PM, Auburn Mayor Nancy Backus took the stage. “We know 100% why we are here tonight, because every one of us in this room have the best candidate for the 8th congressional district,” Backus said. Hader applauds her campaign staff and volunteers for their hard work and support. Hader then took the stage. She thanked everyone for showing up tonight to the election party and especially thanked those who continuously showed up during the campaign. “What a privilege it is to see everyone in this room,” Hader said. She then proceeded to call the results. “We came up a little short tonight,” she said. She closed by saying “Put that same support you so generously offered me during the primary and put it behind the Democratic candidate to flip this district and beat Dino Rossi in November.” The crowd cheered. “It’s going to take all of us,” she finished. Before leaving she added that she expressed thanks for how many of her friends were in the crowd cheering her on. She had friends from all walks of life, including middle school and high school, cheering her on this evening. “It was a luxury in this campaign to meet so many new people,” Hader said, before walking into the crowd to give hugs and offer personal thank-yous. Combined, the three main Democratic challengers to Rossi have almost 50% of the vote… more than Rossi’s 43%. That says something about this district’s political evolution. Two years ago, Dave Reichert won reelection with 60% of the vote. © 2019 The Northwest Progressive Institute. The Cascadia Advocate loaded in 0.179 seconds.